After 146 hours, Sweden’s Peak Performance team finished the 430-mile Adventure Race World Championship in Ecuador a respectable 12th place. But as the post-race spectacle died down, the team of four, led by captain Mikael Lindnord, emerged as world-wide fan favorites for a fifth team member they picked up, a lovable stray dog they named Arthur. With two stages remaining in the 10-stage bike, hike, mountaineering, and kayak race, the team stopped to refuel before a 25-mile jungle trek. Out of the woods sauntered up a dirt-covered mutt and without thinking about it, Lindnord tossed him a meatball. When they began pressing through mud and forest they realized the dog had joined them, refusing to leave their side. 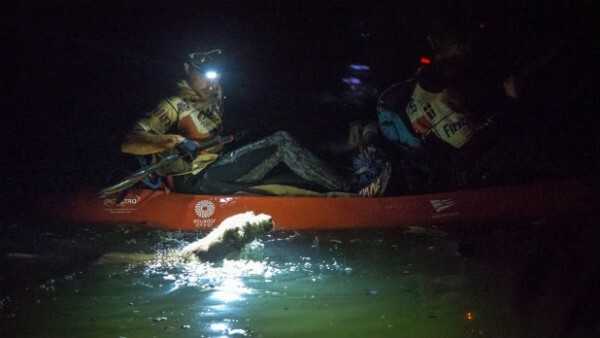 As the hike ended, Peak Performance reached the transition area for the final stage, a 37-mile coastal kayak, with Arthur in tow. Race organizers warned against bringing the big dog on the water, but Arthur made up his own mind, jumping in and swimming along beside before team members took turns carrying him. After the race, Lindnord and the team took Arthur to a vet in Ecuador and applied with the Swedish Board of Agriculture to bring him home. Now, Arthur’s in Stolkholm, waiting out a mandatory 120-day quarantine before he can join Lindnord’s family. The story gets better, after a massive outpouring of support for Arthur, Peak Performance created the Arthur Foundation. The charity will raise money to help and protect stray dogs from abuse. Arthur swims alongside Peak Performance on the final stage.